Sometimes I feel as though the more I cook, the lazier I get. That may be a bit of a stretch, but my point is, good food doesn’t have to take forever. Or include 20+ ingredients. Phew, right? When I make meals like this, I think to myself, “I need more meals like THIS!” Because when I have more time in the evenings, I can do more productive things like workout, spend time with the hubs, blog, walk the dog, lesson plan, read, catch up on TV (okay that’s not productive), and I would say clean, but let’s face it, I’m more likely to do some calisthenics, which I hate doing. Tasty…check! Quick…check! Simple…check! Healthy…check! Great as leftovers…bonus! Chicken salad is something I recommend to my patients a lot, for all of the above reasons. Plus, it’s high in protein and something you can keep on hand for a busy week or…just because it’s delicious. 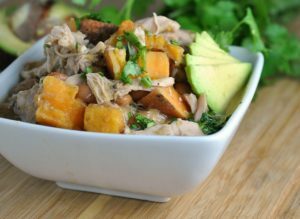 I know this fall when I’m busy teaching during the dinner time hours, I will be looking for more recipes just like this one. Busy people, rejoice and enjoy! Heat the chicken broth in a saucepan over medium-high heat until boiling. Slide chicken breast in, partially cover saucepan with a lid, and reduce heat to a simmer. Poach for 15 minutes or until cooked through. Remove chicken from the broth and let cool on a cutting board. When cool, chop or shred chicken into bite-sized pieces. Meanwhile, combine yogurt, mayonnaise, curry powder, salt, cherries, and apples in a small bowl. Stir to combine and coat the fruit. Stir in the cooled chopped chicken. Taste, and add salt if desired. Cover and chill in the fridge for at least 1 hour. Layer the lettuce and chicken salad onto a slice of bread, and top with remaining piece of bread. Yield: 5 sandwiches. Result: A sweet and Indian curry twist on the traditional chicken salad. 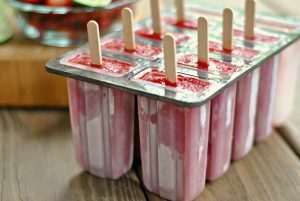 Using half Greek yogurt and half low-fat mayonnaise cuts calories and fat while increasing protein – and creaminess. 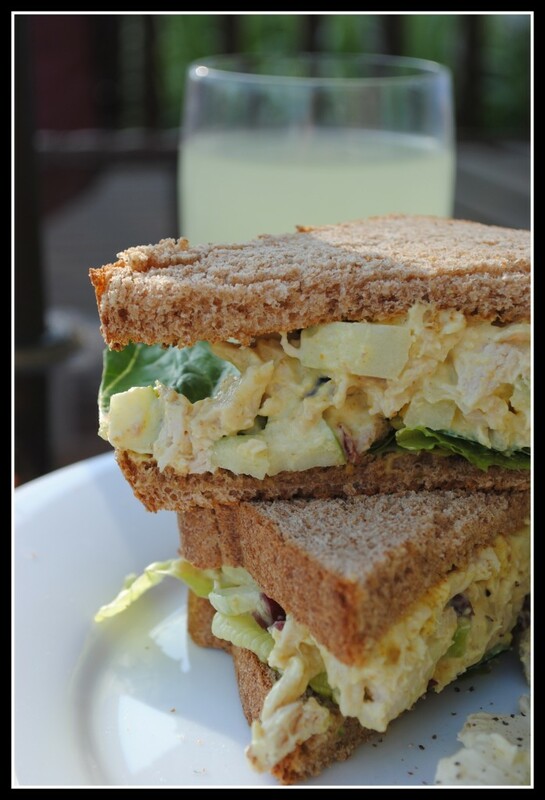 The Granny Smith apples add a tart crunch that keeps this chicken salad tasting fresh day, after day. 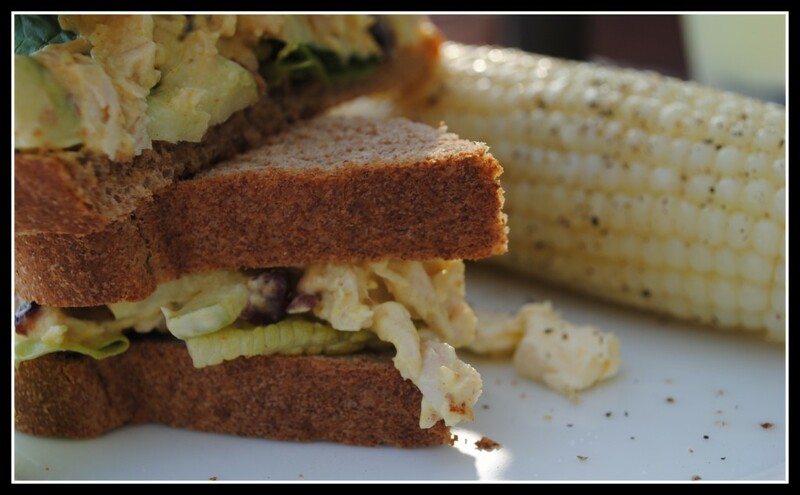 Enjoy this chicken salad in the ever famous sandwich form, or stack on crackers or a crisp bed of greens! A dialysis patient of mine got a kidney transplant over the weekend and is doing wonderful!!!! 😀 I’ve been working in the world of dialysis for over a year, and this is the 2nd transplant I’ve seen come about. It’s big, exciting stuff! Mid Ohio Nutrition Specialists officially opened our office yesterday – we are feeling rather accomplished! I had a killer elliptical workout – I didn’t talk myself out of a workout even though it didn’t happen until after dinner and cranked out 3 hard miles in 33:45 on level 7 of 10. Questions: What was the highlight of your yesterday? Do you like chicken salad? I’m glad yesterday was a good one! I’m not so much a chicken/tuna salad person, but my boss is a major creature of habit, and that’s all he eats for lunch every single day. Yeah… it’s weird. I love chicken salad…a long as it doesn’t contain celery! Your recipe looks great. I love curried chicken salad!! Looks delicious! I’m so with you – I’ve become so lazy with my cooking. The fewer ingredients, the better! I LOVE chicken salad! I love chicken salad! I do love that you did both mayo and greek yogurt. Great idea!! HI Nicole, what a stellar day. That has to be so rewarding seeing transplant patients flourish!!! And YAY for the office opening! VERY happy for you! Hope the trend continues and today is a good day!!! Oh my gosh I love chicken salad ESPECIALLY when curry is involved. It’s been too long since I’ve made this. Great recipe and congrats on opening up shop! Nicole, I have been a dialysis nurse since Aug. 1987 and I have to agree with you those transplants make for great days ! I made your southwest turkeyburgers with the avocada drsg last night . It was wonderful . Plan to make the pnut butter pretzel balls today IF we dont have to deal with getting ready for a hurricane. thanks for ALL the great recipes and the great pictures that entice me to try the recipes. yum! I boiled some chicken yesterday to make chicken salad with. Think that will be my “dinner” tonight!